The people who live in Reza’s village think of him as a simple minded young man. He transports passengers through the road which has been destroyed by flood on his motor bike when he meets a young girl who’s the new teacher of the village school and falls in love with her. A love so pure that ends in driving him crazy and it seems like only a miracle can save him. 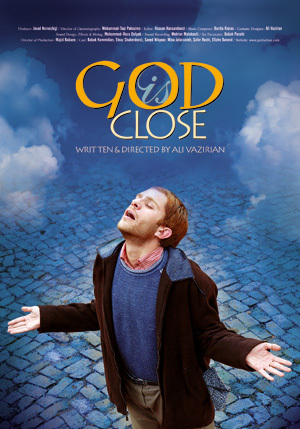 “God is Close” is Vazirian’s first feature film and it is about love from a spiritual point of view which ends to a miraculous experience. This movie received the honorary diploma for the best first film director at the 25th Fajr International Film Festival 2007 (Iran) and won the special prize of “Don Tonino Bello” from the10th Religion Today Film Festival in Italy (2007).